Allow me to go personal for a minute. I was precisely the wrong age and mind-set for “Star Wars” in 1977, a 20-year-old film-studies snot grooving on all these “difficult” moviemakers I was then discovering: Fassbinder, Bergman, Kurosawa, the lot. I enjoyed George Lucas’s space opera while simultaneously scoffing at the notion that anyone could possibly take it seriously. Not until two decades later, watching it again through the eyes of a 6-year-old daughter, did I connect with the movie’s iconic pop thrill. Some of the “Star Wars” sequels have been great fun. Others have been dire. But, really, I’ve never thought of them as anything more than pop-culture candy. “Star Wars: The Last Jedi” is the first one that tastes like steak. It’s not a perfect movie, but it may be a great one. The midsection sags and, other than the heroes’ desperate attempts to survive, there’s no central story line to pull the various satellites of action in its wake. Some of the characters, like Captain Phasma, a gleaming chrome Boba Fett stand-in played by Gwendoline Christie of “Game of Thrones,” get frustratingly little screen time. You feel the 2½-hour length at points, but not — and this is crucial — in the final 40 minutes, which are as visceral and visionary as anything in the entire series (and, honestly, in contemporary commercial cinema). 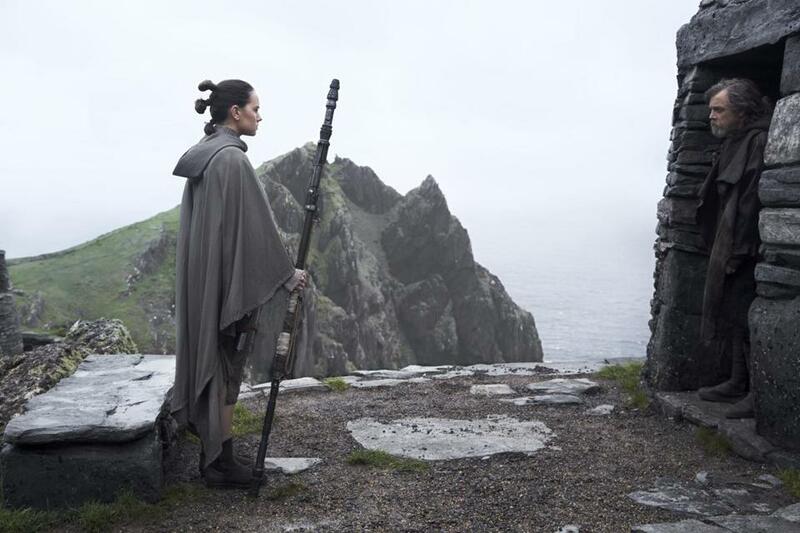 Above all, “The Last Jedi” has both lightness and gravitas — the weight that comes with a smartly made, fully felt pop entertainment connecting with a cultural moment in which a majority of audiences may feel beaten down by events in their own universe. I don’t want to lean on this too heavily, or to imply that the filmmakers are consciously striving for metaphor. But it’s there. As the sacred opening info-crawl informs us, the rebel Resistance is down to a tattered remnant, and the dark forces of the First Order are intent on snuffing that out. The Order is led by Supreme Leader Snoke, a misshapen and genuinely frightening Machiavellian creep digitally embodied by actor Andy Serkis with his usual flair. Beneath Snoke on the organizational chart is General Hux (Domhnall Gleeson), comically puffed-up and inept, and Kylo Ren, who in Adam Driver’s subtly showy performance is rather like Darth Vader having an extended adolescent fit. The rest of the protagonists keep re-sorting themselves into groups based on hair’s-breadth missions and immediate needs. Finn (John Boyega), the stormtrooper-gone-good of “The Force Awakens,” spends much of the movie racing around with ship’s mechanic Rose (a stalwart Kelly Marie Tran), trying to monkey-wrench the enemy with the possible aid of a shifty fellow played by a stuttering Benicio del Toro. Hothead fighter pilot Poe Dameron (Oscar Isaac) and his bowling ball of a droid, BB-8, want to jump into the fray, while Resistance Vice Admiral Holdo (an elegant Laura Dern, toggling cannily between cold authoritarianism and warmer wisdom) wants to run away to fight another day. Finn (John Boyega) in a scene from the movie. Harrison Ford’s Han Solo is gone, but bits of his sardonic brio feel passed among the other characters like cornbread; unlike the strained humor of the Lucas-directed episodes, the laughs in “The Last Jedi” are rooted in character, deflating the series’ tendency toward pomposity without undercutting its essential seriousness. Perhaps most movingly, General Leia Organa is here even though Carrie Fisher, the actress who plays her, is no more. Fisher’s death a year ago may be one reason her character is out of the running for the film’s middle stretch — and may account for that section spinning its wheels more than once — but she’s front and center for much of the first and final acts, and the movie seems reluctant to let her go. As are we. Fisher was always the reality principle of the “Star Wars” juggernaut, an admission that people are messier and more valuable than any comic book hero. Her irony and her struggles wrecked and ennobled her, and Fisher’s evanescent presence — the sense that she’s gone but her dry, droll pixels remain — feels like a passing of the generational torch. “The Last Jedi” is directed by Rian Johnson, who made one wonderful high school noir (“Brick,” 2005), one whimsical mess (“The Brothers Bloom,” 2008), and one time-travel mindblower (“Looper,” 2012) before being handed the keys to daddy’s car. He’s a born moviemaker, and there are sequences in the new movie that can take one’s breath away. A kinetic multi-player broadsword fight in Snoke’s throne room, the scarlet walls eventually giving way to reveal an endless star-field, is one of the most finely choreographed action sequences in recent memory. A climactic confrontation on a mining planet, its salty crust atop a field of rich iron ore, is visually beautiful in ways Kurosawa might have admired, as straight red lines etched in the surface by combat vehicles turn chaotic with battle. Johnson is a movie lover but he’s also an artist, and he’s assembled a deep bench of fellow artisans to help him realize his vision in ways that feel truly fresh. The editing (by Bob Ducsay) and the camerawork (by Steve Yedlin) use close-ups and deft cutting to put us into an ongoing telepathic argument between Rey and Kylo Ren, as they seesaw over meaning and morals across the parsecs of space. Can Kylo be turned from the dark side, as his grandfather Darth Vader once was? Is he playing a longer game? Driver cuts a less imposing figure than old Darth, of course, but Kylo is slippier in ways that seem oddly relevant, sulking for sympathy like a social media sad-boy who may or may not be the most toxic troll of all. Kylo Ren (Adam Driver) cuts a less imposing figure than old Darth. It’s such undercurrents that anchor “The Last Jedi” to today and, if you’re of a mind, can even prompt gratitude for a pop entertainment aware of how fragile simple decency can be. The film may seem especially resonant to younger audiences who feel the world currently coming down around their ears like a destroyed planet. I have this on good authority: That 6-year-old daughter, now in her early 20s, who sat beside me in the screening and, to no one’s greater shock than her own, found herself in tears. “Star Wars: The Last Jedi” is a thrill ride and a great good time, but it’s also about finding inspiration among the embattled and the principled, no matter how outnumbered they or we may feel. Written and directed by Rian Johnson. Starring Daisy Ridley, John Boyega, Carrie Fisher, Mark Hamill, Adam Driver, Oscar Isaac. At Boston Common, Fenway, suburbs; Jordan’s Furniture IMAX in Reading and Natick. 152 minutes. PG-13 (sci-fi action violence).